Here at Dunkley Music, we know how special your piano is to you. And when it comes to tuning or repairing your piano, you only want the best. We have two in-house piano technicians on staff. From a simple tuning and voicing to complete action rebuilding and repair work, Chief Concert Technicians Paul Schiller and Jared Phelps are highly respected and known nationally for their expertise. 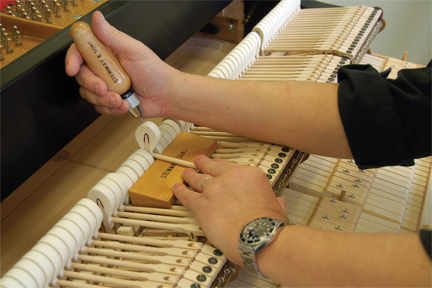 Your piano is in excellent hands when either highly qualified technician works on your instrument. 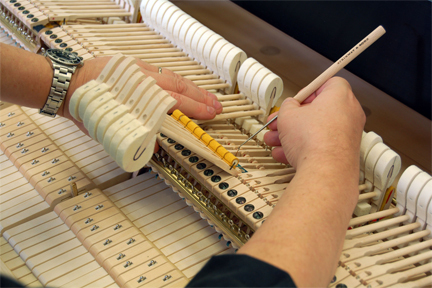 To book a piano tuning, repair, or estimate please call our scheduling desk at 208.342.5549. Rates vary by location and will be quoted at the time of booking. Get to know our technicians! Paul Schiller, a native of Grinell, Iowa, is a concert pianist and master Steinway technician. He earned a degree in Piano Performance from Pacific Lutheran University, and then graduated from an intensive piano technical program at WITCC. Followed by an apprenticeship with Steinway & Sons’ legendary tuner Franz Mohr. 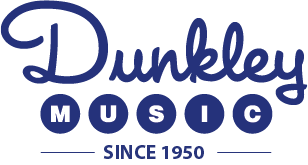 Since 1975, Paul has been the Chief Concert Technician at Dunkley Music. He has tuned pianos for many artists including Isaac Stern, Itzac Perlman, Marilyn Horne, Jean Pierre Rampal, Claude Bolling, George Winston, Ramsey Lewis, Peter Nero, Ray Charles, Woody Herman, Doc Severinson, Kenny Rogers, Joan Beaz, and many, many more. Paul continually updates his training and has returned to the Steinway Factory in New York many times, as well as the Steinway Factory in Hamburg, Luxemburg. He performs, teaches, does technical work on instruments, and volunteers in the Northwest in various musical and professional organizations. Jared started his career at Dunkley Music in 1992 in the piano delivery and moving department. His excellent innate mechanical ability launched in him into the role of piano technician. Under the direction of Paul Schiller (Dunkley Music), Doug Neal (Western Iowa Tech), Bob Schoppert (Aspen Music Festival), and Eric Schandall (Steinway & Sons), Jared has become an expert in the field of Piano Technology. He services pianos in Washington, Oregon, Idaho, Montana, and Nevada. Graduating with Honors in Piano Technology; Jared is among a select few with a college degree that encompasses all aspects of piano work. He has experience in piano rebuilding, refinishing, regulation, and tuning. Jared tunes pianos for various concert venues and has tuned for Lyle Lovett, Jim Brickman, Curtis Stigers, Paul Tillotson, Jack Johnson, and many more. By October 1st, 2016, Jared will be trained in repairing and servicing Steinway & Sons the Spirio, a new high resolution player piano.